When guests first step inside Virgin Hotels Chicago, they’re welcomed to a beautiful historic lobby – elevator doors of polished brass, a limestone staircase with an oak banister and the building’s original cigar bar. Designated a Chicago Landmark in 2003, the Old Dearborn Bank Building was an office building when Virgin took over. The old cigar bar which is now the front desk sit just inside the front door. Instantly, visitors are greeted by a friendly, yet mysterious and eccentric gentleman named Chad Edwards. Chad has worked at the hotel since it opened in 2015. He oversees the property’s concierge program, providing guests special amenities, top city recommendations, culinary hotspots and just about anything they need. 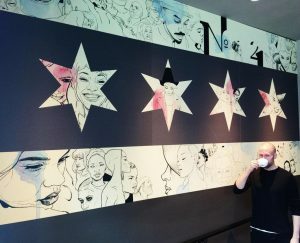 More than keeping up with reservations and wild requests, Chad is the creative mastermind behind a unique mural showcasing notable Chicago faces that hangs inside the hotel’s coffee shop, Two Zero Three. 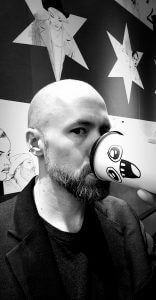 When culture lovers, art addicts and tourists want to know where to go, what’s new, and what’s off the beaten path, they chat with Chad. We spent an afternoon with him to learn a little more about his art and his must-see recommendations around Chicago. Q: What was your inspiration behind the mural in Two Zero Three? A: Our CEO, Raul, wanted something that tied the hotel to the city. Everyone in Chicago has an obsession with the Chicago flag, plus it’s a strong symbol of powerful graphic design. I took the basic graphic element and filled it with images of people from the city, people I’ve met over the years. Q: What is your favorite memory at Virgin Hotels Chicago? A: Pouring paint on Millie Brown from the rooftop. Check the video out here. Q: You’ve curated a few art shows over the years, including one recent show here called Behind the Bottle. What are you most proud of? A: There was a performance art/fashion show I curated called “Drapes of Lust” at Mane Salon that came together very well. I normally work within the 2D art world in both my curations and personal work but I am a lover of the all the arts. This show afforded me the opportunity to work with many talented artists that I might not normally work with. I co-curated a large group show with my dear friend and former Virgin employee, Lola Schalekamp, called “Figure & Form”. We had an amazing line up of artists, there was a tremendous turnout, and everyone was in a great mood. Q: How about art pieces that you have created? A: I am never fully happy with the pieces that I create. I love the potential of a piece but when everything is set in stone I’m chasing that potential with something else. I think I’m happiest with my sketchbook pages because they are messy collections of that potential. There is a cover for a magazine in Japan that I still feel pretty good about. A: James Jean. The man can do everything from densely complex yet easy, to read illustrations to understated classical portraiture, and it all feels authentic. He’s like the David Bowie of visual art. Always changing but always himself. Ashley Wood is another artist I love that is always changing things up, but is still very much himself in whatever medium he uses. Q: What makes Chicago an art-friendly city? A: There is a diverse network of artists, patrons and appreciators. Q: Name your favorite Chicago-artists. Where can we find them? A: Noelia Towers; Kayla Mahaffey; Rawooh. Q: Let’s talk outdoor art. Where are some of the best outdoor murals? A: The B-Line project along Hubbard Street has given birth to some really spectacular pieces. There are too many to list. The Robin Williams mural on the side of the Concord Music Hall by Jerkface and Dippie is also great. I love the juxtaposition of realism in Mr. Williams’ face against the bright blue repeating cartoon figure of, the Genie from Aladdin. There are a few awesome murals hidden on Mendell Street that most people don’t see. Max Sansing and ROA did my favorite pieces of the bunch. We used to have a mural by Hera (one half of the German duo Herakut) and Lie, but it was painted over, sadly. Q: If you had one day to explore Chicago, where would you go? A: Start with brunch at either Lula in Logan Square or Beatnik and listen to Daniel Villarreal spin. Then, I would go to the MCA and take in some art. Maybe catch a movie at the Music Box Theatre. Get some ramen at Wasabi. Finally I would meet up with some friends for cocktails out at Dorian’s.